There's something so nostalgic about wooden toys, I can't help but think about childhood. Perhaps its the simplicity of them? They don't light up, talk or play nursery rhymes but there's a certain warmth about them that draws you in. I always imagine a little old man in his back shed carefully hand crafting the wood into something magical. Spending hours and hours making sure its just right. Wooden toys just feel like a whole lot more love and care went into creating them as opposed to the latest plastic toy. When I was younger I remember using wooden blocks to build cities and car ramps. My imagination used to run wild. That's something I definitely wanted to pass onto my daughter. I want her to experience the joy a little piece of wood, carved just the right way, can bring into her life. These days wooden toys are so much more advanced than I remember. They're painted in bright colours. They have spinning and moving parts. You can get anything and everything from fake food to doll houses. Yet they still have that unmistakeable old world charm. I've been waiting ever so patiently to introduce bub to the joy of wooden toys. Now that shes more capable of actually playing with toys and understanding them (instead of just wilding whacking them or eating them) shes finally old enough for some wooden toys. Anything that makes music is still the flavour of the month at the moment. So, keeping that in mind I managed to find the cutest toy that combines the nostalgia of yesteryear, the quality of wood and the intrigue of music. 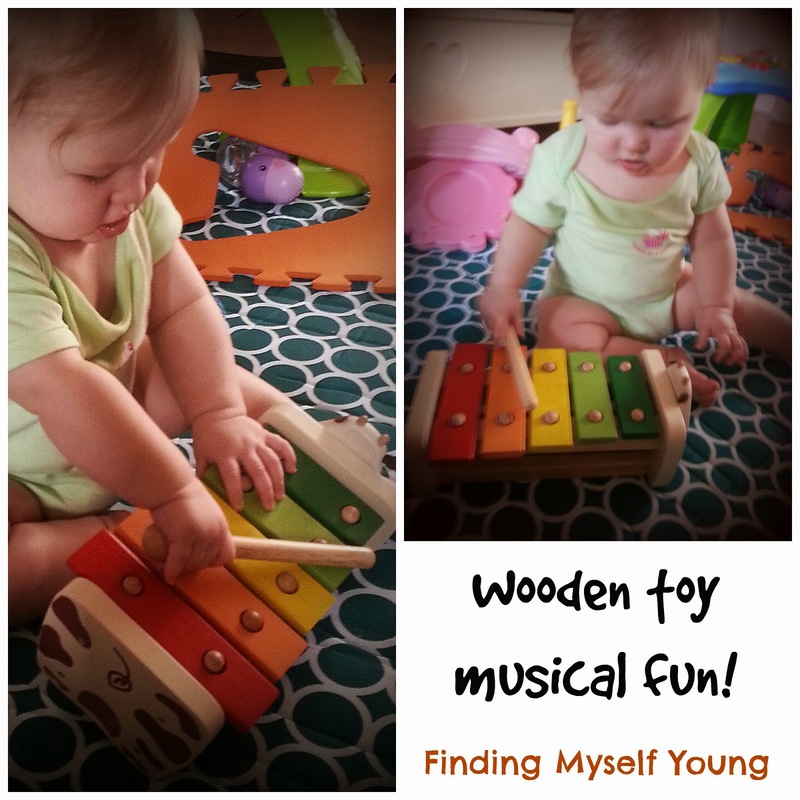 Her first ever wooden toy is a cow xylophone! Yes, you read that right. I'm pretty sure every child at some point or another has a xylophone (or a keyboard). It's kind of like a right of passage. This is just a far more interesting and less annoying version. It still makes noise, but nowhere near as much as the electronic keyboards do and she has to hit it for it to make any noise. No crazy scary sensor activated nursery rhymes going on here - thankgod cos those things always have a habit of going off in the middle of the night and scaring the crap out of me. It also means she learns how to play it herself so shes learning a new skill as well as cause and effect. It says on the guide that it's suitable for 19 months plus and given bub is only just eight months old I never expected her to grasp the concept straight away. Shes actually done surprisingly well. She copies me and hits the keys to make noise (with and without the stick). I wouldn't quite call it music yet. She prefers to hold the ball end in her hand and hit it backwards and we've discovered it also makes a nice accidental teether. Despite all this shes still managed to get one thing down pat... and by pure fluke I managed to get it on video when I didn't even know she could do it! I didn't even realise she was paying attention to me the few times I've done it in front of her. Clever little chicken. There's still loads more we can do with the xylophone as she gets older. 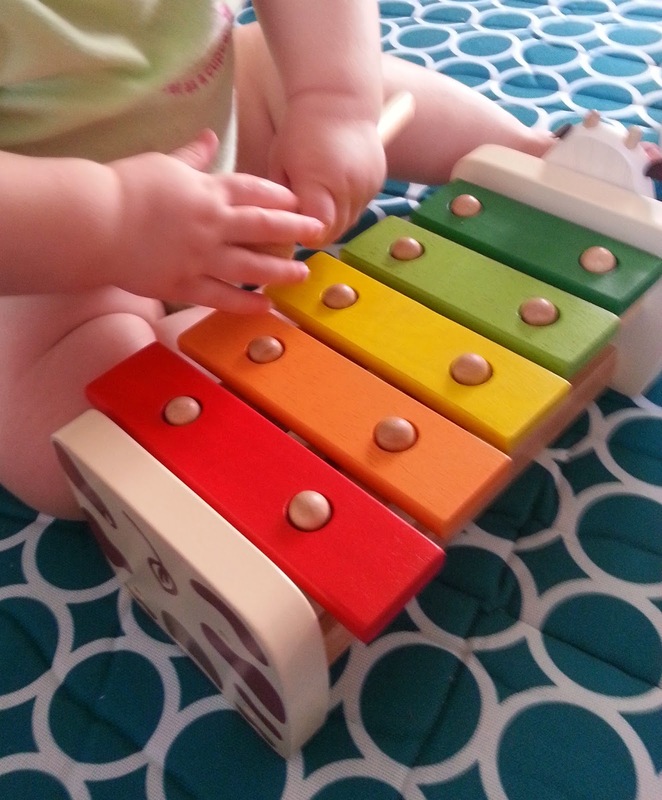 The coloured keys are great because I can use them later to help her learn different colours and hopefully one day she'll be playing the xylophone like a pro (however that is...). 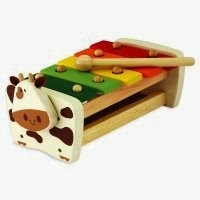 I got the xylophone from Beaches Kids which is an awesome store located in Sydney's northern beaches. Luckily for me they have online shopping as well because I can't really go catching a plane interstate to buy bub toys (as much as I love her, I'm not that dedicated). 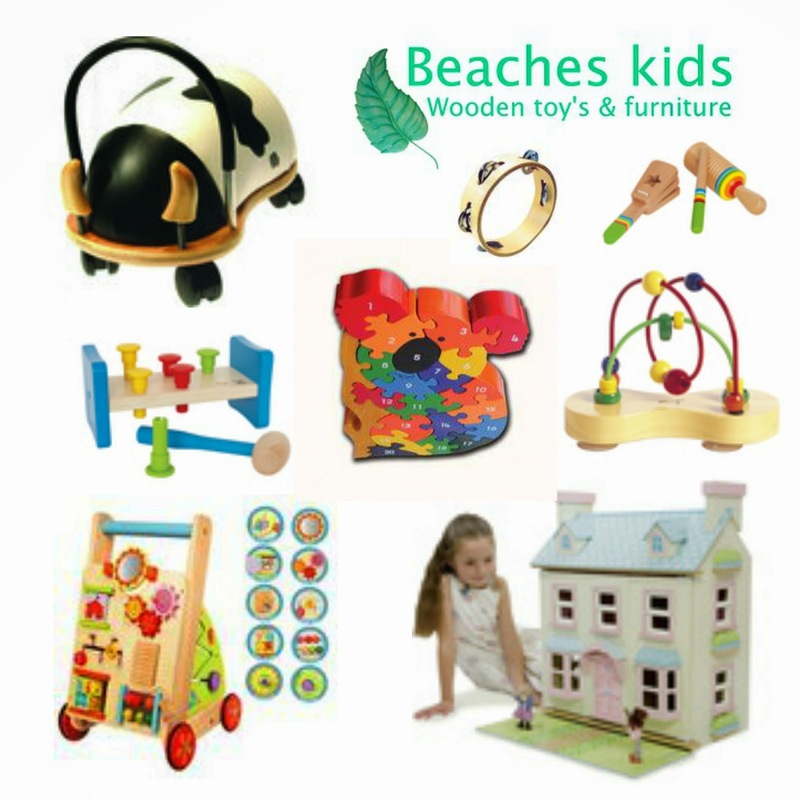 Beaches Kids specialise in wooden toys and furniture for kids of all ages. You may remember they donated the very popular Koala number puzzle for my second anniversary giveaway. Beaches Kids is run by Julie who is a mum herself with four kids, including twins. The business focuses mainly on wooden toys because Julie wants to bring you quality, durable toys that will stand the test of time and can be passed down through generations. She stocks a huge range of wooden products including musical toys, puzzles, games, walkers, bikes, cars, beds and dolls houses, amongst others. As a special offer for Finding Myself Young readers, you can get 10% off all items at Beaches Kids. Simply use the code FMY10 at checkout.You can see a brochure of all their products here. Those are my favourite ones above. How cute are the wheely bugs? And every little girl needs a dolls house, right? Did you have a favourite wooden toy when you were young? *Disclosure - I was not paid for this review. All opinions are my own based on our experience with the product. I will definitely be saving these to pass onto her kids too. A handmade wooden rocking horse sounds amazing!